Back when I was in college, I studied abroad in Italy on a minor in black and white photography. Little did I know that my time spent in an art school in the sleepy town of Orvieto would inspire me with ever so many culinary delights. Simple lunches consisted of ingredients considered haute in the states – fresh porcini mushrooms, black truffles, fava beans and homemade gelato. All was washed down with a crisp, luscious white wine called Orvieto Classico (with a recipe dating back to Ancient Roman times). It was a dream. As a recent ex-pat of New York City, I’ve made fast culinary friends here in Phoenix, many of whom are voracious foodies. As a means of treating them to the delights I tasted and experienced in Orvieto, I decided to prepare a full-on feast celebrating the dishes that managed to stay imprinted in my memory. Incredibly, FoodBuzz felt that my plan was lovely enough to include it in the 24×24 for July 2011 – a monthly event showcasing posts from 24 Foodbuzz Featured Publisher bloggers from around the globe during a 24-hour period. The moment I found out the good news, it was on like donkey kong. This menu celebrates fresh ingredients highlighted as stars of simply prepared dishes – fava bean bruschetta shines with the addition of salty pecorino and floral mint. Fresh tagliatelle with porcini mushrooms take the stage as a reminder of an Orvieto lunch favorite. And I can’t forget the dish that made me question all I’d known about pasta up until the first time I tasted it – drunken pasta cooked in red wine until purple with a blond oxtail ragu (no tomatoes!) Madness, but delicious all the same. A sliced tenderloin of beef with creamy artichokes serves the main course, a stunner for anyone with expensive tastes and a limited budget. 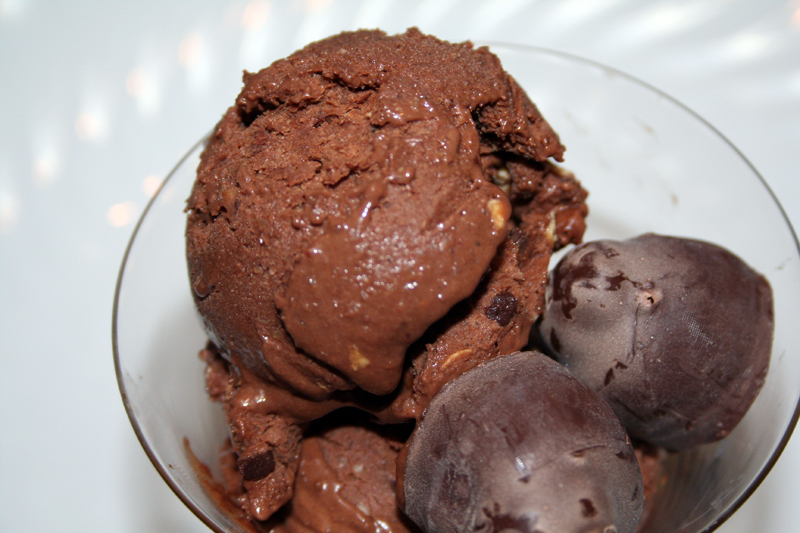 Dessert is a glorious scoop of bacio gelato, an addictive combination of dark chocolate and hazelnuts. And for a last taste, the most beautiful digestivo with a homemade limoncello that will impress the pants off of anyone you deem worthy enough to try it. For a play-by-play of the culinary goodness that occured in my 24×24, click on the links to the individual recipes below. Each one has a lovely history attached, and cooking them again for the folks here in the lawless desert reminded me of how blissful it can be to take a little time to celebrate the ingredients that inspire and amaze. Buttery fava beans and fruity olive oil get their swerve on in this luscious topping for crunchy toasts. This tangle of fresh pasta, mushrooms, wine, butter and parmesan is trouble. Like eat the whole bowl with no regrets kind of trouble. I completely authorize your using your fork as a weapon to keep away anyone who wants to steal a bite. The drunken bit refers to cooking the pasta in red wine, which gives it a gorgeous garnet hue. And the blond reference in the ragu means no tomatoes – just fall off the bone beef slow simmered with veggies and more wine. Oh so good and well-worth trying. The beef tenderloin is treated rather simply with just a smattering of salt and pepper, but then the lily is gilded with an accompaniment of artichokes in cream sauce. Creamy and decadent, here I use the clutch recipe from Ciao Bella to get the job done. This one takes time to mellow into happiness, but if you leave it alone to do its thing, you’ll be rewarded with golden nectar from the gods. Or at least that’s what it tastes like after you’ve knocked back a few chilled glasses of the goodness. I didn’t have a kitchen to cook in while I was in Orvieto, but if I did, this would’ve been the soundtrack. This song was on non-stop that summer in Italy.